During the process of making curd, bacteria convert milk into curd and predigest the protein. These bacteria then inhibit the growth of illness causing bacteria inside the intestinal tract and promote beneficial bacteria needed for digestion. Hence, the protein in curd is more readily digested than the protein in milk. It has been estimated that regular milk is only 32 per cent digested after an hour in the digestive tract, whereas 91 per cent of curd is digested within the same period of time. The nutrients present in curd are easily absorbed by your digestive system. Not only that, it also helps in absorbing nutrients from other food items that you have eaten. It can also be used along with spicy food, as curd cools down and neutralises the heat that these foods create. In a day and age where more and more young people are falling prey to heart disease, consuming curd can go a long way in maintaining a healthy heart. It minimizes the risk of high blood pressure and helps reduce cholesterol levels by preventing the thickening of carotid arteries. Some people, who cannot consume milk because they are lactose intolerant, can safely consume curd. It converts the lactose present in milk to lactic acid, making it easier to digest. Also, you do not lose out on the nutritional boost that milk provides. Curd has ‘good bacteria’ present in it which strengthens your immune system by fighting against several microorganisms that are present in the body. It is also useful in preventing vaginal yeast infections in women. 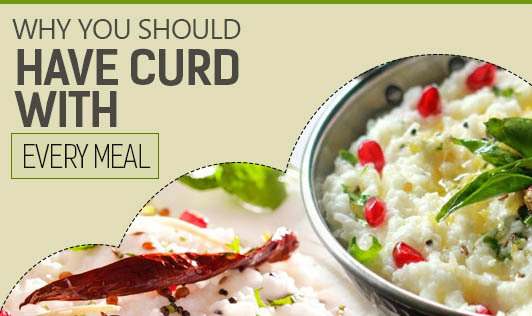 These properties of curd do not diminish even when it is heated along with curry preparations to add flavour. All dairy products are good for your bones, and curd is no different. Like milk, curd has a high amount of phosphorous and calcium. This makes it beneficial for your teeth and bones as it helps promote bone growth and makes your teeth stronger. Taking care of your bones is essential if you want to avoid painful diseases like osteoporosis and arthritis in the future. Nutrients like zinc, vitamin E and phosphorus make curd a natural skincare product and it is often used as an ingredient in homemade packs. A simple mixture of curd, gram flour and lime juice can be made at home to give you an attractive and glowing face. Many advertisements claim to have found the magical chemical formula for curing dandruff. But, curd can be a simple homemade solution. Why is it good to get rid of dandruff? It has lactic acid which has anti-fungal properties. What more? You don’t even have to add other ingredients to it. Just whip some curd in a bowl, and add it to your scalp. Leave it for an hour, and wash properly with water. You may also like to read about this home remedies for dandruff. Whenever nutritionists make a diet plan, the first thing they include is curd. The calcium present in it prevents your body from pumping more cortisol. Hormonal imbalance of cortisol is responsible for a host of problems like hypertension, obesity and cholesterol. you may also like to read about these foods that promise weight loss. Being stressed can wreck your health. Finding ways to relax and rejuvenate is imperative in today’s world. Along with other things, eating some curd can surely help. According to a study conducted by UCLA’s School of Medicine, eating curd was linked to lower levels of activity in the part of brain responsible for emotion and pain. Here are some natural remedies for stress. All these health benefits make curd a superb food item that you and your family should consume on a daily basis.